This necklace can also be made in Gold. Note that against a white background, this Clear Crystal Heart with an AB coating will appear vibrant blues and purples. Against a black background, the Heart will appear fiery oranges and yellows. See the custom cross below for an example. 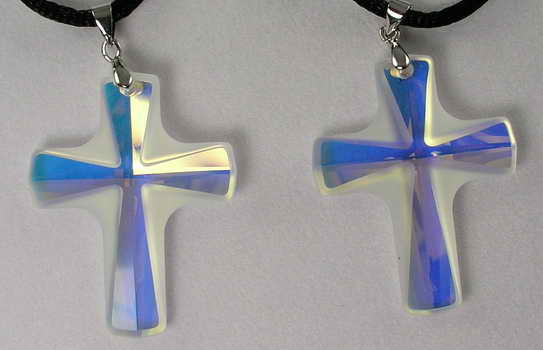 Note: These Clear Crystal Crosses have an AB coating that will vary in color depending on the background color. As each cross is custom made, the chain and various beads can vary. Against black, the cross will appear a fiery oranges and yellows. Against white, the cross will appear stunning blues and purples.